Moored off Newhaven harbour after a collision. The "Crystal Jewel" was in collision with another vessel in the channel in fog. The damage can be seen in the bridge area. As I recall, the master's daughter was killed in the incident. I'm not guite sure which year this would have been. Another view, with the harbour bucket dredger passing. This also shows the railway lines on the breakwater for the trains involved in maintenance work. This page was added by John Sweatman on 09/03/2010. I think it was late september 1961 John. Yes, and it also shows quite a number of members of the public when they were allowed to walk along their breakwater - and when it was maintained and safe to do so. 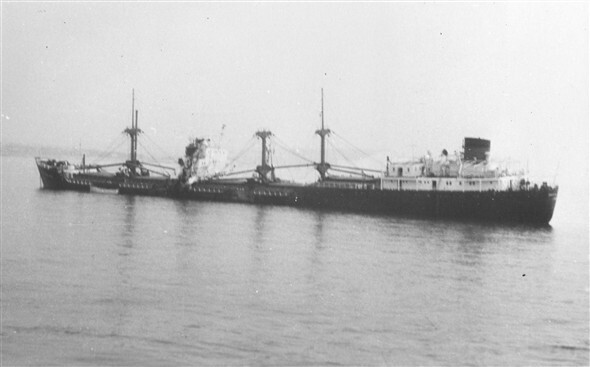 I was a member of the crew of the Tug MEECHING at the time of the incident. I believe I may be the last surviving member of the crew from the era. The saddest part of the story of the incident was the fact that the Crystal Jewel's Captain had his daughter on board at the time and she was in the cabin. Sadly she died in the wreckage of the midships section that took the brunt of the damage in the collision which took place off Beachy Head in thick fog. My brother had the unsavoury task of recovering her from the twisted mess of the midship section. If Marcus wishes to make contact with me I'd love to swap notes with him on the tragedy and the aftermath. I was on-board the Crystal Jewel at the time of the collision as a very young Galley Boy! It is now lovely after all these years through the wonders of the internet to be able to see pictures of the Crystal Jewel - would love to hear from anyone who was on-board the Ship the same time as me. I was the one with the delicate job of removing the Captains Daughter from the ship. The Captain had been taken to hospital in Eastbourne with two broken legs and other injuries. It was there that he said farewell to his daughter who was taken to Liverpool where her funeral took place. One thing I remember well were the comments of Fred Holden, the tug Skipper. He complained that it was rare for the tug to be involved in salvage and he missed it because he was at a football match in London and to cap it all the team he supported lost !! I think it was rare for Meeching only because she was so new, Trevor! She later had quite a lot of salvage work, again detailed in her own Our Newhaven page. Later members of her crew also sometimes kicked themselves for not being around for a 'shout'! However, contrary to some stories, the payouts to Meeching's crews were never huge, and hardly warranted to huge risks they took at times. My brother Michael Balchin was on that ship at the time of collision!! I was an apprentice deck officer on the 'jewel'. At the time of the collision I was having breakfast in the officers saloon. I was very friendly with Dorothy , the captains daughter. It was a shock to learn of her death. There were rumours at the time that "looting from the ship" was rife! Is this true? Rumours indeed, and several of Meeching's crew were taken to court. All were found not guilty.